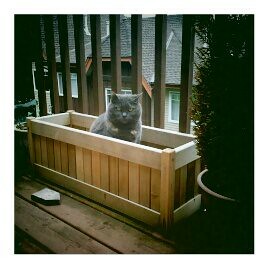 Another daily griz: grow your own kitty, originally uploaded by ebbandflo_pomomama. The exact date is a little hazy, but around 20 years ago I met mr ebb (author's note: he's called mr ebb from my days on the etsy forums - ebbandflo was my user name, and spouses were usually referred to as mr/ms etsyusername). We were in our mid-twenties, semi-introduced by a mutual friend on an almost blind date. The rest, as they say, is history. Having just been through two gruelingly awful relationships and constantly reminded how difficult I was to live with, I was utterly gobsmacked that anyone would give me a second glance (I was a total catch). We 'dated', he moved in after six months, and we've been together ever since, getting a married a couple of years later. We pass our 18th wedding anniversary later this year, and have had our Wee Guy in tow for almost half the time. Twenty years is quite a monogamous milestone of duration these days. My parents will be celebrating their own Golden Wedding anniversary this summer; I can still remember them hitting the twenty year mark, never thinking I might be doing similar. Wow! So what does twenty years of domestic bliss look like these days? Well, we did the exotic holidays, the two-week ski trips, migrated southwards, bought a few houses, shared pets, and so on in the first decade, pre-child. We've done the high-living young exec thing in London too, read Sunday papers in bed till after noon. We've hiked the Lake District, chased cockroaches to kill the time on honeymoon (whee! what a wild time that was) and slept off the jet lag in a number of luxurious hotels around the world. We've monitored hair loss/white hairs, gravity and aging. We've grown into middle age with each other; familiar housemates comfortably getting older together as we potter around this house we share. Over time we've grown used to living in the same space, accommodating habits, behaviours and quirks. For instance, I know that he's into family- rather than date-nights, so we have movie nights (complete with popcorn maker scored from the local thrift!) and save a bundle on babysitting. He's not really into festivities, romance or special occasions - I get my ''fix" at the movies, call on friends, or take myself off to the ballet, etc. rather than drag him out after a hard day at the office when he'd rather be finishing some work or reading his Kindle/iPod quietly on the couch. He's not a going-out kind of guy so I'm lucky there are never any conflicting engagements on the calendar (except when he travels and then I do have some babysitting numbers I can call). Once in a while I might arrange an evening out for the two of us - I booked tickets for Eddie Izzard last year, and managed a trip to the movies the year before (unfortunately for us, once I've finished organising the Wee Guy's social/school life I have very little energy to carry on with the concierge service hence the lack of exciting nights out, sorry). The household admin and finances are tasks I've had to take on so I stay financially competent while unsalaried. Likewise house decor projects. On the plus side, no arguments about what colour the bathroom will be (FYI: it's still the same colour as when we moved in 5.5 years ago) and mercifully, I don't have to hide 'his' tools at the weekend, crying, "No more DIY!". It's not all roses though; I'm what's known as a processor - I need to talk (and talk) through what's going on around me to make sense, remain connected. He's a more classic introvert who withdraws and prefers to ignore it/let it quietly disappear rather than hash it out in the open. It also means that he doesn't bring any issues to the table. I have had to reign in my natural instincts (not always successful) to hunt a problem into the ground. Yes, I'll admit this is a struggle for me to try to keep it all inside, solve problems internally yet retain attachment; occasionally I do have to vent some steam (which, I will learn one day, never gets me anywhere). Avoidance and withdrawal is hard to deal with, when you need the verification of response, as is having a partner who seems to dredge up Every Single Little Thing. The vocal partner is frequently seen as the stereotypical nag, whereas the withdrawing/absent partner is always seen as strong and silent to sympathetic onlookers. We seem to have coped OK over the decades and will doubtless carry on as before. I worry we talk to each other less and less. I wonder if I will need to keep busier and busier to fill in the gaps and subdue my characteristic processor behaviour. I do sometimes wonder if this is how a long-term relationship is meant to be - should there be more excitement, companionship or sharing perhaps, or is this how two people manage life together? He makes me chamomile tea in the evenings, does some housework, earns the money, empties/fills the dishwasher, steps in with childcare, keeps a roof over our heads, works from home so I can keep up with college courses, and cooks at the weekends (including waffles for breakfast). In return, I do the grocery shopping, keep him fed and raise our child, keep his clothes laundered, file the bank statements, and make sure the bills are paid on time. We both benefit. I cope with his snoring/sleep apnoea, silence, lycra, an excess number of bicycles in the garage, and body hair. He made it thru my labyrinthitis and copious vomiting, labour, deafness, hair dye, symmetrically-arranged eggboxes, on-call weekends, unsuitable dinner conversation, visits with my family, miscarriage, and shingles (note: not all at once). He isn't my best friend or any other kind of cutesy relationship descriptor; we're in a domestic partnership. In summary, I am one very lucky woman (as has been pointed out to me on many occasions) - I'm married and we have a child, and did I mention the domestic bliss? I have a somewhat stable financial future. My son is growing up in a relatively comfortable household. I don't suffer any physical abuse. There is a roof over our heads. I live my life without interference and am free to plan my days. I am not overtly controlled. I'm grateful someone wants to live with me so I don't have to be solo. I am not alone. self portrait thursday triptych, originally uploaded by ebbandflo_pomomama. sometimes it's good to get all dressed up :) even if it's for the most mundane of days. .... because inspiration is what it's all about at any age. Here are some of the ones which stick to my Google Reader like glue - inspirational reading relevant to my lifestyle and life stage. Local blogs - Amber's is a great start at Strocel.com and check out Harriet's blog on open adoption at See Theo Run for some thought-provoking posts on motherhood. Tracy runs a great fashion for the over forties crowd at Fashion Forward 40 and Jen, who also manages the New West Farmer's Market blogs at Arbolog. Another great (and recent) find is Alexis at Wave the Stick on parenting (and more) in Vancouver. I've just started with this one on home organisation and family - the author has just returned from a six month visit to Venice with her family (lovely pics). And for how to plan with loads of kids around (and make you appreciate having only one or two underfoot) try Planning with Kids - Nicole includes a post about menu planning and has some yummy slow cooker recipes. 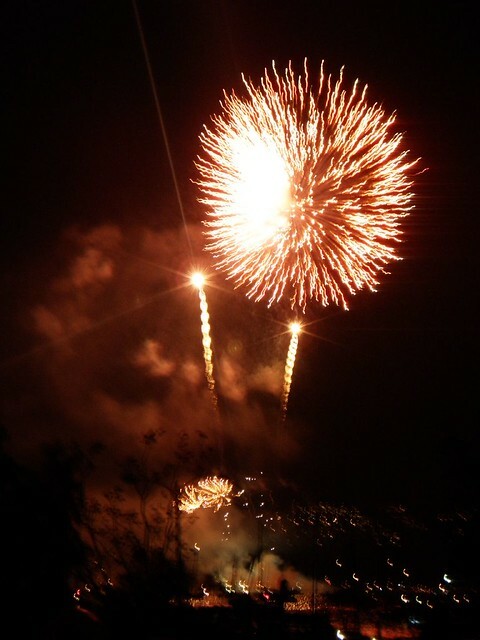 On bravery, there's my friend, Frances's blog Just Frances on coping with grief, but also facing a very exciting life change as she prepares to move from the US to Scotland to pursue her educational dream. Go Frances! ... and finally for giggles, follow this blog, Basic Instructions and wish Scott a speedy recovery after his tonsillectomy. 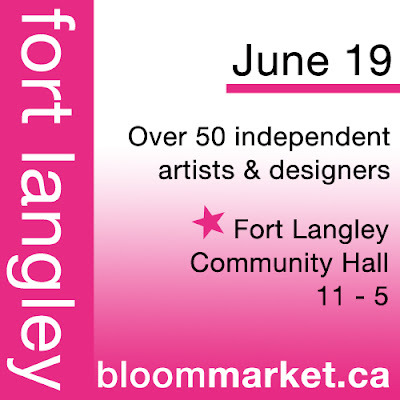 The Bloom Market runs again in Fort Langley on Sunday, 19th July - Father's Day! 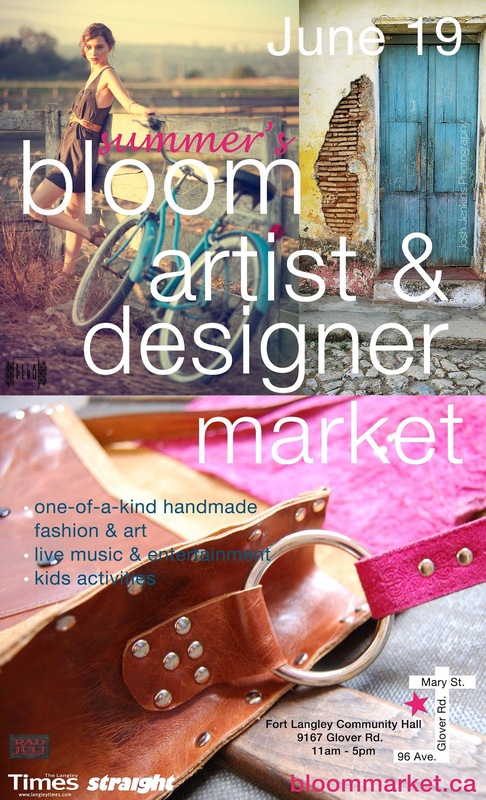 I'll be there with a host of other amazingly talented indie artisans. Market opens at 11am in the Fort Langley Community Hall at 9167 Glover Road, and runs until 5pm. Admission = $2 for adults (children free). 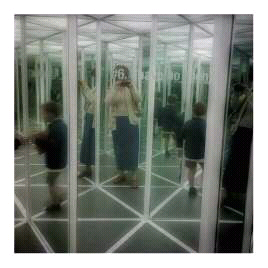 Well, not truly surreal but we did see the surreal at the Vancouver Art Gallery. And yes, it did seem a little surreal to walk past boarded windows and over scuffed floors where looters had rampaged less than 48 hours earlier. Another slightly surreal thing was the vast amount of grafitti on the boards condemning the rioters and expressing thanks to workers involved in the clean up. I had wondered if the Wee Guy would be OK going in to downtown as he was upset by reporting on the riots (as well as the canucks losing) but he didn't express any concerns. As with all date nights, everything was taken at full Wee Guy speed. I let him lead the way through the exhibits with occasional guidance when I thought something would interest him. We managed all four floors in not too much haste, though I will return to the surrealism at a more leisurely pace. It's wonderful to have an afternoon set aside for being with my son, undistracted by floors, cooking, repairs, household finance, bill payments, and so on. Yes, it is odd I need to schedule it, especially since I'm a SAHM and don't have the distraction of real work and office hours. But maybe without the obvious demarcation of work space vs home, and the regime of the 9 to 5 date night is equally valid for carving out this mythical entity, 'quality time'. It seems to work for us; I get to go out and spend one-on-one time with my son, and he is learning about making special time for someone in his life as well as developing his social interests. 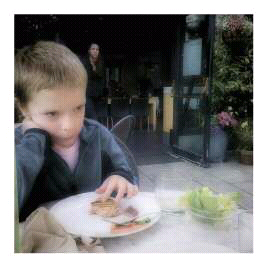 Wonder what I'll do when he's too cool to hang with mum? photo silly: day 4, originally uploaded by ebbandflo_pomomama. This is one of my assignments for a photographic course I'm taking just now. It was to set up a still life from near ground level which would reflect ourselves to others. Well, I'm nothing if not ms multi-tasking so let me name the ways in which this pic illustrates that fact. Taken beneath my desk in the dining room, you can see nail polish, a computer power cable, my toes and a pile of books. Yes, I'm retouching my pedicure while finishing off some homework and finalising some travel plans for the summer. Of course I'm also multi-tasking with the photograph itself! Why do one thing when you could accomplish a million more? wordless wednesday: World Oceans Day: "
Please note, shipping is extra (please see my Policies page for details). In one swift stroke of the pen er, keyboard I'll dismiss the 'goal' part of the title since I'm not really sure where I'm heading. But I do know it's somewhere with writing, either arts or science (or both). To this end, I've been focusing my volunteer efforts into areas which expand my skill set and contribute to some kind of portfolio, in addition to giving me a quasi-work-experience type of vibe.The piece below is from a blog I run for a local artist's co-operative which I'm a member of (no, I don't always include my own work!). It's given me great experience in setting up, contributing to and maintaining a non-profit social media network. I'm still finding my voice with the tweeting (so hard when it's not for yourself) but the blogging is finding its own pace. Don't Forget: Father's Day Is Coming Up: "
Don't forget, Father's Day is coming up soon (that's Sunday, 19th June to be precise). Although dads can be a little trickier to buy for, not all of them want a laz-e-boy recliner (or however it's spelt in the flyers arriving since mid May) or golf equipment. 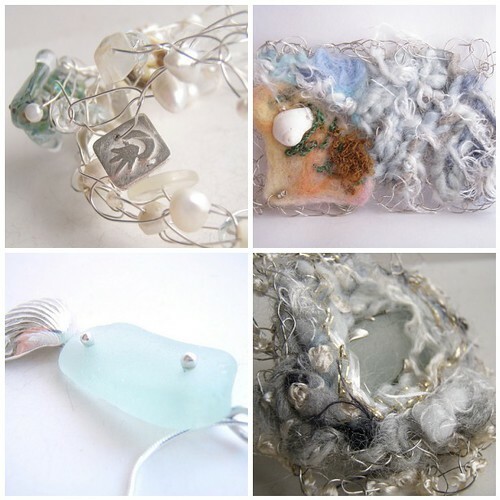 Why not take a trip to your friendly neighbourhood artisan artist co-operative gift shop (yes, that's us) for some truly original one-of-a-kind handmade gift choices? 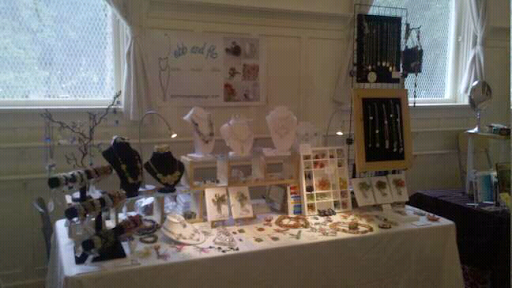 We have some great wood intarsia art, stunning driftwood carvings and even some classy sterling silver cufflinks on offer. As your one-stop gift buying experience, we also have re-usable cloth gift bags and a selection of art cards to complete your purchase. Happy Father's Day - we're better than furniture! just in case you're at a loss for what to do in the V3H this morning! Music in the Park, Sunday June 12th: "
... and then the desserts! Oh my! Wee Guy's chocolate 'Mouse' cake didn't disappoint in the slightest, and the grown ups' tasting platter came complete with a lit birthday candle embedded in the incredibly rich chocolate pate slab (oh my, again). We chose an early time slot, partially to take advantage of the seafood entree coupons and also in deference to those lucky couples who were out for a night for two sans child(ren). Ah date night ... a dim dusty memory around these parts. 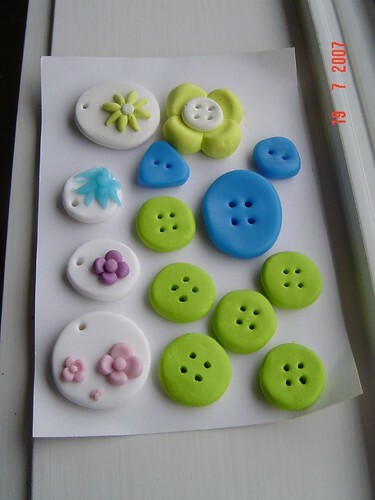 polymer clay stash - what i did today, originally uploaded by ebbandflo_pomomama. I've catered beach BBQ's for 50, run a college reunion weekend (including paintball with only one guest breaking an ankle), organised my own wedding, coordinated continuing ed for a local professional group ... as well as executed several house purchases, moves, relocations (including overseas, and with pets), and international travel with child, on the domestic front ... blah blah blah. In summary, I am a capable human being. Maybe I'm just a little too capable? Ladies (especially mums), have you ever run into this problem? In your role as super "get it done" gal, do you find that when you want to take a back seat, nothing gets done? No one takes over? Yes? Thought so. It's a peril of being capable - you do have to keep on at the 'getting it done' yourself. There are relatively few vacations and no emergency cover. And it extends into domestic life too, from household repairs to date nights to signing the cheque for the damn book order. 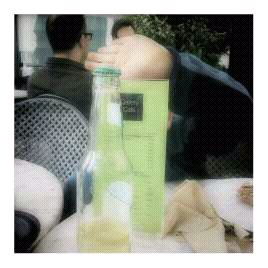 Taking a break means that the life grinds to a halt even though the world keeps spinning. Sigh! Ladies - in the face of 'equal' partnerships, is it time to develop our incapability and incompetence powers, or just ask for help more often? More importantly, is there something you can do to help a neighbour take a break from being "get it done" gal, even if just for an hour or so? Not everyone has, ahem, help on tap. PS: I'm a mere newbie at this 'getting it done' lark compared with the amazing Tammy who is running the fundraising for Melissa. Check out the website and see how you can help. SPT June 9th: homework, originally uploaded by ebbandflo_pomomama. Catching up with homework before class, still clueless, but might have sorted out something else. Spaghetti bolognese sauce in the slow cooker, bag packed for class, furnace fan now wired up to spread cool air round the house in the summer. Laundry - check; dishwasher - check; bread - check; cat litter box cleaned- check; floors swept - check. 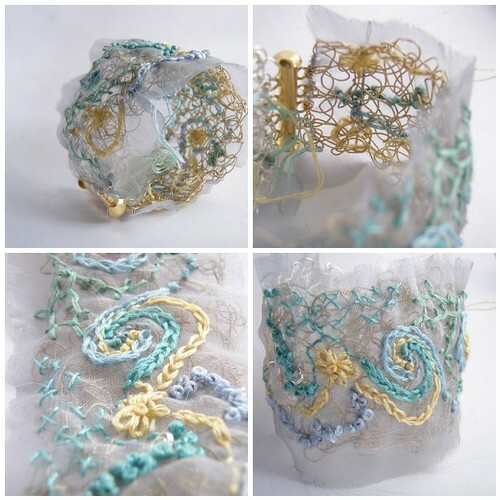 embroidered organza and wire cuff, originally uploaded by ebbandflo_pomomama. Last weekend I felt inspiration creeping back. I converted some of my very boring yarn stash into less boring, less white versions of the same by handpainting some hanks. Lack of skill, technique, equipment and so on was no obstacle but the resulting knotted string soup hammered home the 'thou shalt tie thy hanks securely' message. It also reminded me that I knew nothing about string theory. For the uninitiated and the curious, string theory is a concept in physics which explains why you cannot walk through walls à la Men Who Stare At Goats. It has its own website and vocabulary (confusing vocabulary) and threatens to expose the great meaning of everything. According to string theory, electrons and other subatomic particles aren't discrete zero dimensional objects. It ascribes physical characteristics to the paths they follow, rendering them as strings (or branes, a sort of membrane). These have characteristics, which alter the perspective of the viewer, and thus underlie the theory that one string could be seen as different subatomic particles depending on its oscillation or tension at that moment. The size of the string varies and is dependant on the tension it is under. You will no doubt be relieved that, although it can approach unity, a string will not become a single point as this would confound the Heisenberg Uncertainty Principle (or would it?). In traditional particle physics this principle could theoretically be applied to almost describe a theoretical situation in which electrons and the spaces between them in two discrete masses were aligned thus allowing solid A to move through solid B. String theory explains why all you will get if you try to walk through walls is a bloody nose (unlike the X Files). Though not scientifically proven, lying in the la la land of the scientific mind that is theoretical physics (theoretical by virtue of there not being enough engineering on earth to build a research facility with sufficient frictionlessness and vacuum to test out even the most basic of models), string theory does however suggest that somewhere out there in academia, someone is feeding hash brownies to particle physicists. CERN is in fact a huge bakery and hydroponics lab. I won't even mention the God particle or the 6th, 7th and 8th dimensions. But that's not what you're here for! 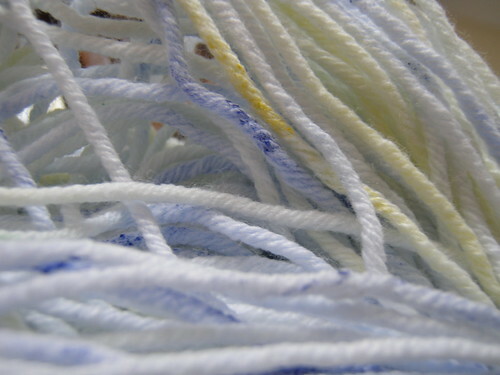 Hanks of Cottonease were handpainted with dilute acrylic solutions after pre-washing in a 1:3 vinegar solution. 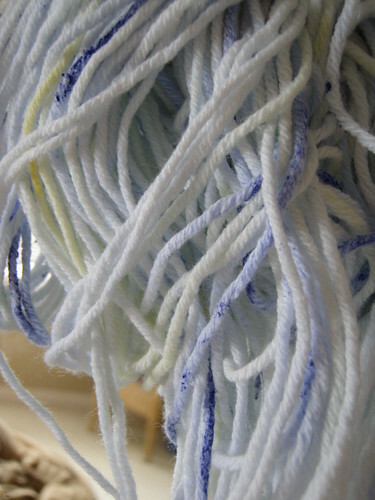 Fibres were heat set for approximately 3 minutes on full in the microwave before tumble drying, then rinsed thoroughly to remove unconjugated dye particles. The colour is very much paler than the initial paint session. My technique needs a little tweaking, or maybe the fibre doesn't obey the elementary rules of string theory in the first place. Anyway, they'll make a nice scarf.